I touched on the question of UHI the other day, and questioned whether NOAA/GISS were adequately allowing for it. The extent to which two widely-used monthly temperature datasets are affected by urbanization bias was considered. These were the Global Historical Climatology Network (GHCN) and the United States Historical Climatology Network (USHCN). These datasets are currently the main data sources used to construct the various weather station-based global temperature trend estimates. Although the global network nominally contains temperature records for a large number of rural stations, most of these records are quite short, or are missing large periods of data. Only eight of the records with data for at least 95 of the last 100 years are for completely rural stations. In contrast, the U.S. network is a relatively rural dataset, and less than 10% of the stations are highly urbanized. However, urbanization bias is still a significant problem, which seems to have introduced an artificial warming trend into current estimates of U.S. temperature trends. The homogenization adjustments developed by the National Climatic Data Center to reduce the extent of non-climatic biases in the networks were found to be inadequate, inappropriate and problematic for urbanization bias. As a result, the current estimates of the amount of “global warming” since the Industrial Revolution have probably been overestimated. The GHCN/USHCN network is the only source of land temperature data used by GISS and NCDC, except for a handful of Antarctic stations supplied by SCAR, the Scientific Committee on Antarctic Research. GHCN is also heavily relied on by HADCRUT. 1) Although a third of the GHCN dataset is rural, almost all have very short records. Also, note the large step in the percentage of urban sites around 1990. 2) The GHCN dataset is homogenised, with the objective of ironing out “inhomogeneities”, i.e non-climatic biases introduced into temperature records, as a result, say, of station moves or equipment change. Ronan contends that, because rural stations are heavily outnumbered by urban ones, the trends of the rural sites tend to be adjusted up to match those of urban. This, obviously, is the opposite of what should be happening. It is, of course, the homogenised, adjusted temperatures which are then fed into the GISS and NCDC global datasets. The paper gives two examples in detail of how badly the homogenisation process is going wrong. 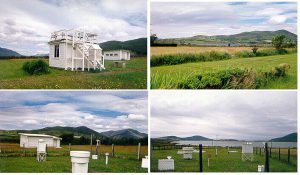 Valentia is high quality, long running station in the SW of Ireland, with continuous records dating back to 1880. Situated in genuinely rural conditions, it should boast one of the best records for long term climatological purposes. It will come as a surprise, then, to discover that the NCDC algorithm introduces a warming trend of roughly 0.4°C/century! Did the program figure this out by comparing it to rural stations? No, because there are no nearby rural stations that would have a long enough record to compare it to. Instead, the program introduces the warming so that the Valentia Observatory record better matches the records of its urban neighbours! Figure 36 shows the effect of these adjustments. Before homogenization (top panel), the Valentia Observatory record varies between periods of cooling and periods of warming. However, after homogenization (bottom panel), most of the cooling periods have been eradicated, and the record shows an almost continuous warming trend since the end of the 19th century. As a result, it makes the last decade or so seem “unusually warm”. In other words, it looks pretty much like the “global temperature trends”. With Buenos Aires, the opposite occurs. Despite being situated in a highly urbanised environment, the GHCN homogenisation process makes no adjustment at all to temperatures there. And why? Because nearly all of the neighbouring stations, that are used to “homogenise” against, are urban. Well Paul – Valentia is a very good example of the problem. The only question is – is the end product mendacious or merely incompetent? Answers on a postcard to ..
To add to the widespread use of poorly exposed and urbanised sites being used to “correct” quality, well expose sites, you also have to add the practice of homogenising good quality northern latitude sites with other data from hundreds of miles away. For quite a few years I thought it was incompetence — no longer! If the adjustments were equally distributed around zero, i.e., some made the trend warmer, and an equal number made the trend cooler, then that would be an argument that lack of skill (rather than a conscious bias) was responsible. If the adjustment algorithms were clearly documented to allow public review of the procedure, that would be an argument that lack of skill (rather than a conscious bias) was responsible. Most importantly, if documented and obvious errors in adjustments were corrected after being made known to the researchers, that would be an argument that lack of skills (rather than a conscious bias) was responsible. Sadly, we have seen none of those responses to errors in adjustments. The method and reasons for the adjustments are clearly documented. What is not documented is the actual Values they end up with compared to the “projected values” that the algorithms are supposed give. Also not documented and widely known is the reasons for Continuously adjusting them, ie not just once as the methodology suggests. Another thing not documented it the reason for selecting the Weather stations used, dropped and re-introduced over the years. Another thing not documented is the Quality of the Weather Station Sites used. Another thing not documented is the actual accuracy and error bars of the Equipment used. Another thing not documented is the differences between Mercury Thermometers and Electronic Thermometers. Another thing not documented is the actual treatment of UHI adjustments which mostly appear to be counter intuitive to how it should work. Another thing not documented is the is how poorly the Homogenisation process is applied, see Paul’s work on South America as an example. Another thing not documented is the fact that they make adjustments to data already adjusted by the originating Met Office, see Paul’s work on Iceland. Is that enough to be going on with do you think? (i) “the widespread use of poorly exposed and urbanised sites being used to “correct” quality, well exposed sites”, and (ii) “the practice of homogenising good quality northern latitude sites with other data from hundreds of miles away”. It was reading, disbelievingly, about those two idiocies that first made me a climate sceptic. Back then I took them as evidence for the incompetence and low intellectual standards of “climate scientists”. I interpreted the rise of crookedness in climate science as being an attempt to disguise such shortcomings. Since then, I dare say, younger crooks have been attracted to a discipline where their vices are viewed as virtues. And this is what passes for science? What I learned in junior high science class was that you had to compare like things. Obviously, those perpetrating these crimes are deliberate. They might have argued they didn’t know before Climategate – but after they had every opportunity to find out what was wrong and clean up their act and instead they used this god sent opportunity to hide their dirty laundry – after that there was no doubt it was intentional criminal behaviour. Apples and oranges: They pick oranges because they prefer warmer temperatures! this is normally for nighttime temperatures which, as far as my understanding goes, is when most warming has been measured. So I think the Met Office is saying that UHI is several degrees, about 4 Celsius?